I bought almost 750gr of (non Granny Smith) sour green apples in Mersing last week because at that time I was craving green apples so badly. Unfortunately, I brought home really sour, thick-skinned and hard-to-bite green apples. I only ate probably three apples from the whole bag and as of yesterday morning, I still had lots of sour green apples leftover in the fridge - which I found pretty inedible to be eaten just like that. In the end, I decided to make use of them for Apple Pie, something that my husband has challenged me to do for a long time. After browsing lots of Apple Pie recipes in the internet, I decided to follow the tested Apple Pie recipe from Joy of Baking. I modified the original recipe and techniques here and there to suit my ingredients and utensils availability. Also, I didn't make the top pie crust as I only made half of the pie crust recipe (because I thought the original recipe would give me too much of pie crust dough). In the end, half of the pie crust dough was only enough to make the bottom pie crust. Anyhow, below is the recipe and simplified step-by-step tutorials of the Apple Pie that I baked yesterday. If you want to make the top pie crust too, double up the amount of the following pie crust ingredients or refer to the original recipe that I used for further instructions. My first creation of home made Apple Pie. 1. To make the pie crust: In a large bowl/container, combine the flour, castor sugar and chilled butter with fork or fingertips until the mixture resembles coarse meal. 2. Add the iced water onto the mixture and incorporate well with hands until the dough holds together and is not sticky to the container/bowl. 3. Turn the dough into a ball, cover it with plastic wrap and refrigerate for about one hour before using. The pie crust dough ball to be refrigerated before use. 4. To make the apple filling: In a large bowl, combine the sliced apples, sugar, lemon juice and cinnamon powder. Let them sit for minimum 30 minutes to capture the juice. Marinating the sliced apples, sugar, cinnamon powder and lemon juice. 5. Once the juice comes out, drain the sliced apples and collect the juice. 6. Cover the drained sliced apples with corn starch. Mix well and set aside. Combining the drained sliced apples with corn starch. 7. Bring to boil the apples' juice with butter until it's syrupy and caramelized. Set aside. Caramelizing the apple juice with butter. 8. To assemble: Transfer the flattened pie crust dough onto the pie pan. 9. Arrange the sliced apples on top of the flattened pie crust dough in the pie pan. Pour the apple syrup onto the sliced apples evenly. Apple Pie: Ready to bake. 10. In a preheated oven, bake the Apple Pie for about 30-40 minutes or until the pie crust is golden brown and the apples are tender (but not mushy). My version of Apple Pie: Fresh from the oven. 11. Garnish with sifted icing sugar, if desired. Ready to serve: The cinnamon aroma of this pie was so delightful. Rolling the pie crust dough to flatten it and transferring it to the pie pan were huge challenges for me. Next time, I would probably just use ready-made pastry dough or pie shells from the supermarket for the pie crust. In addition, I guess another lesson learnt in making this apple pie was not to use (only) sour green apples for the apple filling. I should have mixed it with the sweeter (red) apples too. I had pretty sour apple filling despite the amount of sugar that I threw in to the apple filling mixture. Oh, well... I indeed learnt some lessons during my first bake of apple pie and will take these into considerations for better bakes in the future! Nevertheless, at least by now, I have tried making one by myself. Finally, most of all already heard of the famous expression, "One Apple A Day, Keeps the Doctor Away". If you want to learn more about the health benefits of apples, please read here. Pregnant Women and Their Cravings: What Do These Mean to the Husbands? Some of my friends who are pregnant or already given birth often ask me if I am craving anything during my pregnancy now. I said “YES, lots of things!”. Some of them shared their experiences that they once craved some weird stuff too during their pregnancy period and advised me to just enjoy whatever cravings I currently experience. Some even said that I am so lucky to experience the ‘craving’ phase as they didn’t develop any crave at all during their pregnancy. The question is, in reality, are expectant dads out there really lucky to have pregnant wives with food cravings? Just a little background, from my quick various desk reading, I gathered that there are three probable key reasons that make pregnant women crave certain foods – although these theories may not be scientifically proven yet. First of all, the main culprit of a pregnant woman’s craves is likely the surge of pregnancy hormones that is mighty to alter some pregnant women’s sense of smell and taste plus their gastronomical imaginations to some abnormal level. Second of all, pregnancy craving is probably caused by the expectant moms’ temporary nutritional deficiencies and the foods they crave are essential for nourishing the baby in the womb. For instance, if one pregnant woman suddenly craves dairy products, she is probably lacking of calcium at that point of time. Last but not least, strong emotions during pregnancy are perhaps another source of women’s cravings. For all I know pregnancy is quite similar to PMS. It is such a time for eventful emotional roller coasters for some women. When a pregnant woman feels so overwhelmed with her surroundings, on some dark days, her diet may evolve around those elusive empty calorie foods as her comfort fixes. If she lives away from her hometown, her mind could also start wandering over digging in those childhood foods that she used to fancy. Make sense? Moving on, as in my own personal experience, here are some illustrations of foods that I have craved thus far. I believed I have craved or been craving many more of weird food but the below are some troublesome examples that stand out or still stuck in my memories up to this moment. Some of my spicy food cravings have even sent me to the doctor with diarrhoeas. (1) Food that is not readily available – occasionally, my husband needs to drive to a distant place to get me some type of dishes that are not obtainable in town. For instance, in my early pregnancy, I very much longed to eat nice and authentic Ayam Penyet, Balinese Nasi Campur, Gado-Gado and Es Campur that are only sold in some Indonesian Restaurants in Kuala Lumpur (approximately 1 hour drive is required to get to the restaurant from our home in Seremban). Once, I also begged him to buy me a complete set of Nasi Timbel which we could only find in a Sundanese Restaurant in Johor Bahru (3-4 hours driving from Seremban is needed to get there!). all the way to Johor Bahru so I can enjoy it. (2) Expensive food that we don’t usually eat. As you might have known, in a place like Seremban, dining on international food is not cheap. There are times that I craved rare Korean or Japanese cuisines. My husband and I had to spend 3x-5x money to pay for these foods than what we usually spend for our regular meals for two, but I just could not help it. (3) Food that I used to hate. I loved eating Nasi Lemak when I was in Singapore or just a visitor in Malaysia. However, when my status was upgraded to a permanent inhabitant in Malaysia and exposed to Nasi Lemak or Economic Bee Hoon for my regular breakfast – I got really fed up with these dishes and refused to eat them for more than a year. Recently, my appetite has been mysteriously reformed. I have been eating Nasi Lemak and Economic Bee Hoon as breakfast, lunch or dinner way too often to the point that my husband is beginning to ‘unlike’ them. A serving of Pork Bulgogi from a local Korean food restaurant. One serving of this dish, excluding steamed rice and kimchi, costs us RM 25. Despite all this painful cravings, I also developed some ‘easier’ cravings to fulfill during my pregnancy. Easier cravings here define foods that can be easily bought from local food stalls in town or supermarkets. This includes foods or dishes that I need to make myself as well, such as Lapis Surabaya or Javanese Fried Rice/Noodles; as a result, they not too bothersome for my husband to find. So what do all these (re: pregnancy food cravings) mean to a husband? In my take, a husband’s countless sacrifices in going the distance to satisfy his pregnant better half’s food cravings simply means that he loves, cares and appreciates his partner so much. It shows that he is sharing his responsibilities with his wife, in some of sore ways, during her pregnancy and willing to do whatever it takes to make her pregnancy goes well. I am sure when the man witnesses his unborn baby so healthy during the monthly doctor exams, his pains in entertaining his pregnant wife in the previous 29 days are somewhat paid off. Truth be told, a pregnant woman’s crazy craves are torturing and stressful to her partner. When I asked my husband what he feels about his overall experience in treating a fussy and challenging pregnant woman like his wife; he told me that maybe I should just name all the bad things I could imagine off the top of my head to describe his sufferings. Last week, I read a section in a local parenting magazine that features some Moms’ stories of their most memorable pregnancy craving. Essentially this section discusses difficult food craving that required their husbands to go extra miles to get specific dishes for their ravenous pregnant wives. Intrigued by this discussion, I asked the same question to my husband hoping that he would find this question cute. My husband counter queried me. He said, “Why don’t you just ask what was the most memorable easiest food craving that my wife ever demanded from me to date?” I replied, “Alright, what’s that?” He immediately answered, “A liter of ice cream in the freezer that I bought for her.” Fair enough. My whole pregnancy ordeals up to now have not been silky smooth journey on my man. I request a lot of things from him. I suppose a pregnant woman’s craving issues really get into her husband’s nerves when he can’t read her any more. In my case, my pregnancy has turned me into a bipolar woman to some extent. After some continuous whines and hints to get me to a place and buy me some particular food; there were times when we have reached the destination to eat or buy something, I changed my mind of the food that I wanted to have. In addition, there were also times that I don’t know what food exactly what I wanted, given the situation that there are lots of things that I don’t like or can’t eat. The last part can really lead both of us to unnecessary arguments over breakfast/lunch/dinner menu. My husband once said that he has gotten too weary in satisfying all my food cravings during my pregnancy. He also feels that I have deliberately used up all my ‘pregnancy’ rights to make his life more difficult than usual. Yet, none of these was intentional from my end. To conclude, while all the food cravings that an expectant woman demands are really annoying and trying for the husband, I think it is important for the would-be father to keep a cool head, stay patient and supportive as best as he could. All these tribulations indeed test one man’s endurance but yearnings for particular food are just one of those undeniable parts of carrying the little one for a woman. For this reason, expectant dads, please be resilient as this grim phase will pass in due course. Finally, as one of those pregnant women who are experiencing crazy food cravings, let's not forget to thank and show some appreciations to our husbands’ colossal supports in riding all the smooth and bumpy roads during the entire nine-months gestation period with us. P/S: Do you believe the old wives’ tale that says when your food cravings during pregnancy are not well handled; your baby will be born with excess saliva? It was one dull Saturday night in end of March for my husband and me. We were running out of places in town to visit, already had our dinner and wanted to spend some time alone outside the house. After exchanging few ideas, my husband and I decided to crash our best friend's house without notice. Fortunately, he was at home and got nothing much to do either to spend Saturday night. In his house, initially we watched one of western films from his flick collections that my husband and I randomly chose. About an hour into the movie, three of us became wilted vegetables in front of his TV screen. The movie that my husband and I selected was accidentally plain boring. Shortly, we told him that perhaps the three of us should just go out and have a drink in a nearby cafe or something. When we were in his front door ready to go out, our friend had a change of heart and gave us a better idea to kill the night - taking some impromptu late night couple photos in a stretch of vintage shops area along Jalan Kong Sang in Seremban. He would be the photographer (as he is) and my husband and I would act as the models. I hesitated a bit in the beginning since I did not put any make up at all that night and my eyes looked swollen after an episode of crying spells and emotional meltdown at home earlier that day (blame this on my pregnancy hormones again!). In the end, I was like what the heck. Our friend is a trained photographer and he knows how to avoid (my face's) bad angles. Furthermore, photo editing software is so amazing nowadays and our friend has a good Photoshop skill too. Thus, my husband and I quickly replied him with "Yes! Why not?" We spent about one hour posing here and there in this old shops area. It was quite late at night so no shop was in operation. Some people passing by the area gave us some weird glances; nonetheless, we carried our business on. Following are some of the selected results of our late night photo shoots along Jalan Kong San, Seremban. I must say that I felt like my husband and I were taking our pre-wedding photos all over again. However, this time around we did it sans fee, make-up and beautiful costumes. I was trying to conceal my pregnant tummy but could not help to showcase my puffy eyes (and chubbier cheeks). 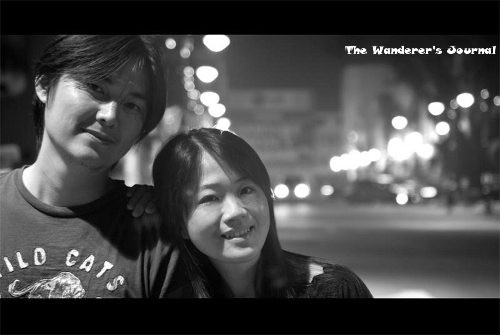 P/S: Thanks for the opportunity to be your impromptu models, Seng Teck! Let's do this again sometime soon. Ever since we got married and moved to Malaysia, my husband and I have been living in my parents-in-law’s house because we were unable to buy a house when we relocated here. That means the two of us currently have to share dwelling with my husband's parents and his younger brother (plus his married elder brother, wife and kids on weekend basis). Furthermore, as of last November, we have a new permanent addition in the house, our latest baby niece as well. A little crammed? You tell me! In the beginning, I had objections with the idea of living with my husband’s whole family under the same roof as I feel that a newly married couple would find lots of difficulties in building their own household and having their privacy this way. Living with in-laws was definitely never my dream nor written in my plan. I mean, in a marriage, adjusting our lifestyle and habits with our spouse already involves a lot of work, let alone, adjusting with our spouse and his/her whole family’s ordeals. Moving on, in my personal opinion, although it is not the end of the world, living together with husband’s family and extended family ain't a walk in the park either - particularly for someone like me who had lived on my own (re: away from my own parents and siblings) for more than ten years. I got to skip participating or listening direct arguments in the house with my parents or siblings for God knows how long. With the fact that now I have to live with my husband’s family members who are not of same national as me, in order to survive, I have to master a lot of tactics so I can successfully get along with everyone. I have to put extra efforts to permanently endure the new life in my in-law’s house as we have different cultures, religions and languages to consider too. In short, the newest family member by law (that’s me!) who recently moved in to the house has to compromise, accept, adapt and understand a great deal of things when living with the big families under the same roof. For me, all this was not a smooth road for the past one and a half year or so. There are often times that I feel I have sacrificed too much and ended up, troubling and hurting my husband when I am personally too overwhelmed with the whole situation. On the bright side, I am actually blessed to have parents-in-law who are quite caring, not fussy and patient to me. In this sense, living with in laws has advantages for us because my husband and I could save money by sharing expenses with his parents in the house, have someone to talk to or chit-chat with at home, don’t have to do all the things needed to maintain the house as we also share some of the daily house chores, have someone who saves our laundry from rain outside and most of the time, have home-made cooked already served in the dining table. That's me: Out and about, once upon a time. Things just get really inundating for me when there are too many people and kids visiting for few days in the house at the same time. Suddenly, I feel like the four-bedroom house becomes too much to handle with too many households in it. When this happens, privacy is merely a fairy tale, noises are all around at all times and occasionally I just wish to put my sport shoes on and run away from the house as fast and far as possible. Having said this, I could not ask my husband to do anything with this situation internally because obviously we are the ones who stay in his family house and he is sandwiched between his family and me should I raise the issue too blatantly. However, I do ask him to take me out of the house (like going to a mall, cinema, restaurant, friend’s house, karaoke, etc.) for few good hours to escape from the crowd in the house when my heart already cannot take it. Accept the situation and try to fit in. Remember that, to begin with, it was our personal well-thought choice to finally agree to stay with our spouse’s whole family. We are definitely outnumbered in the house in many ways. It’s like 1 versus 5 (or more) other people. For instance, if we can’t speak Mandarin well (like myself) while the rests of the family in the house use Mandarin at home then try to learn the language so we can communicate with or at least understand them. Our foreign language skill may not be perfect after a year of constant on-site learning and we’d still need our spouse to help us translate here and there but the learning is worth trying as a mean of fitting in with the other family members and they usually will appreciate our efforts on this. Another example, if we are Christian and the other family members in the house are Taoists then be an open minded Christian when witnessing their Taoist traditional practices and rituals during festivals, etc.. Live in harmony! Be considerate and follow the house rules that already existed long before we moved in the house. This means if the house rules say not to wash our dirty underwear together with other dirty laundry in the washing machine then hand wash them; take our clean laundry from the drying clothes rack once they are dry, then don’t forget to pick them our clean and dry laundry ASAP so other people can use the rack; remember where the kitchen utensils belong in the kitchen then try our best to return them back to their original places after use; clean our own dirty dishes after meal since there is no maid then don’t stack up our dirty dishes in the kitchen sink for other people to wash (although this sometimes may be inevitable); share our private cars with other family members in need, then don’t keep our car key in your room but keep it in the place where other family members keep their car keys together; etc..
Close one eye and ignore. Living together with other people means we have to deal with their good and bad habits at home too. In this case, since we are not authorized to change their bad habits (that, again, had already been in the house before we lived with them), then we might as well pretend not to see and ignore those bad habits in the house half of the time. For one thing, when we see dirty socks that are not our husband’s lying around in the house instead of inside the dirty laundry basket, then just act like we don’t see anything and walk away. Someone who is in-charge for those dirty socks would eventually come and collect them when the time comes. Also, when someone in the house throws fruit peels everywhere in the kitchen sink instead of putting them directly in the trash bin when peeling the fruit; then just clean the scattered fruit peels when we can’t stand the sight of dirty sink. A fight with a family member in the house over fruit peels is not worth the consequences. Pick your battles. Living with big families usually leads to arguments between our spouse and his/her parents or siblings. If our spouse starts fighting, exchanging expletives or arguing with his/her other family members, for our own good sake, stay completely out of it and let them settle the issues on their own. It is highly recommended to avoid getting into arguments with the in-laws in their house. Find a sanctuary in the house. A sanctuary here would usually define our very own bedroom, no other place actually. Whenever I find the house is too crowded and I don’t feel like joining the crowd, I just go to my room and chill there. I don’t hesitate to lock my room from the inside too to maintain my privacy. There are times when the visiting kids (re: nephews and nieces) loudly bang on my bed room door day and night but when I don’t feel like entertaining them or have something I need to do in my room, I would not open my room’s door for them. In conclusion, living with the in-laws needs hard work, 'bigger heart' and continuous efforts. If our in-laws are nice to us then it is a huge bonus as our daily living together with them should be easier in many ways. However, apart from accepting the situation and trying to be considerate in everything to survive in our spouse’s family house, we should be aware that our marriage and personal happiness remain our utmost priorities. When we feel too overwhelmed and frustrated with the whole thing, we should be able to address the issues (nicely) to our partner to work things out and make the living situation less stressful. In addition, trust my words, let's also have low expectation that our partner would be able to help us much with the situation that involves his/her direct family as it is as good as impossible for him/her to make a choice between his/her family and partner. Thus, nothing else we can do but hang in there and wait for that one fine day when we finally live in our own house - where it’d be just us and our partner (and our own kids). This morning, I was casually skimming my old cooking book that I brought all the way from Indonesia a while ago. My eyes happened to land on one recipe of Indonesia's signature layer cake, Lapis Surabaya or Spiku, that is so dear to most of Indonesians. The cake is commonly used for the base cake of decorated wedding and birthday cakes in Indonesia. My first attempt of Lapis Surabaya (Spiku). Usually, the original recipe of Lapis Surabaya would require lots of egg yolks for the cake batter but the one that I found in my cooking book was the simpler version (that also guarantees similar result). It is pretty much a Lapis Surabaya recipe for beginners and only requires 5 eggs for each layer. The recipe looks doable for me, so I gave it a try. Also, I only made two layers (instead of three) of the cake as I didn't feel like spending so much time in the kitchen today. Typical Lapis Surabaya (Spiku): Soft texture and buttery rich in taste. Below is the slightly modified recipe that I used this morning. I only made half of the recipe since I was planning to test it first and did not wish to waste so much ingredients on my first trial. Grease and line a 22 cm x 3 cm cake pan. For half recipe, use a loaf pan. For each layer: Cream the eggs, sugar and vanilla essence by using high-speed electric mixer. Fold the sifted flour, milk powder and baking powder (plus the cocoa powder for the chocolate layer) into the cake batter by using spatula. Slowly pour the melted butter into the cake batter and incorporate well. Transfer the cake batter into the cake pan and bake for about 30 minutes or until the cake is fully baked, golden brown and springy to touch. Leave the cake to cool in a wire rack for about 10 minutes. To assemble the cake: Spread a thin layer of fruit jam or butter cream frosting on top of the yellow layer cake. Place the chocolate layer on top of the yellow layer cake. Serve! Taste and texture wise, I think my first trial of Lapis Surabaya today was not bad at all. The cake was soft and (buttery) rich. However, I definitely need some improvements in creating better presentation for near future bake of this layer cake. I had been longing for 31st of March 2012 (yesterday) to come for about month and counting down the days and night like there was no tomorrow. I deemed that 31st of March was crucial for me as it was the day that my pregnancy would hit about four months gestation age. Moreover, on 31st of March, I was scheduled to see my Gynae's for my regular monthly check up and (yesterday) had extremely high expectation in discovering the gender of my unborn baby. But... more about the baby's gender discovery story later. When I saw my Gynae yesterday morning, before doing the ultrasound scan on my tummy, she asked me to update her on the pregnancy symptoms that I felt in the past month. The following is the summary of my pregnancy symptoms and updates as it progresses into the fourth month. Experienced mild nosebleed - but the Gynae found that nosebleed is a common pregnancy symptom, so no worries about this. Struggled with sensitive gums for a couple of weeks. I thought I had cavities or widening gap between my teeth as I kept on having food stuck in my teeth after meal. Again, the Gynae thought that sensitive gums are often experienced by pregnant mothers too and advised me to rinse my mouth with antiseptic mouthwash to reduce the discomforts from sensitive gums, no need to see the dentist. Kept having the strong feeling to vomit when I brush my teeth. For this one, she told me to change my tooth paste brand to Sensodyne as now I am kind of sensitive to normal tooth pastes. Been having more frequent urinations, especially at night. It's crazy! Been having horrible PMS-like mood swings that ate my husband inside out. I was angry, sad, miserable and overreacted to some unnecessary happenings in my daily life. I had probably three crying spells and emotional meltdowns in the past month alone and many times, I thought that I was heading into a deep dark depression state. My Gynae calmed me down and said that I was nowhere near depression. She explained that hormonal mood swings are normal on expectant mothers and they should be gone by the time the pregnancy hit the 20th to 30th week. However, she emphasized that the mood swings might visit pregnant mothers again during the last tri-semester though. So, expectant Dads, be ready! Occasionally had lower back pains and relied on pain relief liniment on some awful days. Had increased appetite. I felt like I have to eat something in every three hours. Craved for and actually ate more fresh fruits and vegetables on daily basis, which are good things, I guess. Had normal blood pressure at 100/60. I was supposed to do antenatal blood test on my next Gynae's visit but since I had done this about a month before I got pregnant, I could actually skip this and save few hundreds RM after I submitted the blood test result to my Gynae yesterday. Also, my husband and I plan to travel to Indonesia sometime next month so the Gynae released a letter stating that I am pregnant and fit to travel by air for the airline officer's use, when necessary. 15 weeks and 3 days: Baby size is now 10.61cm. heard our baby's heartbeat for the first time, after I requested it. I was so anxious when the Gynae did the ultrasound scan on my tummy yesterday and I kept on raising the burning question on my baby's gender. I thought that we could find out about the gender when the unborn baby is about four months old. I asked her about the baby's gender three times but in the end the Gynae said she could not tell yet. What a shame! 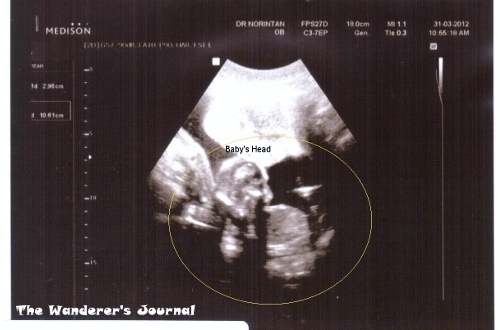 Now we have to wait for more than a month to try peeking at my baby's gender again! Nevertheless, I did understand that probably the Gynae only wanted to give us the firm answer when the baby is big enough to give a clearer ultrasound view on his/her gender. Otherwise, she might have to carry the embarrassment of telling the wrong gender prediction to the parents-to-be and clearly, she doesn't want this. To conclude, honestly, at this moment, I must admit that I am dying to unfold God's one huge mystery in my life: Is it pink or blue? Doctor bills: RM 139.10 (for the Gynae's consultation fee, urine laboratory test, multivitamins, fish oils and 600mg calcium dietary supplement capsules).